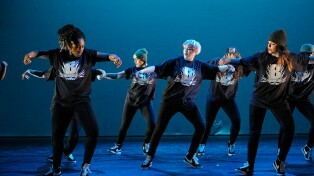 Folk Dance Remixed is a groundbreaking company creating unique fusions between folk and hip hop styles with live music. Led by Artistic Directors Kerry Fletcher and Natasha Khamjani, the company rediscover old traditions through contemporary forms. 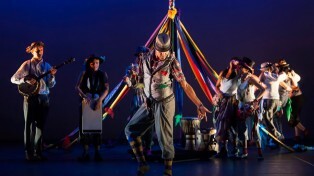 Folk Dance Remixed is about generating a creative playground to grow new and innovative ideas of mixing folk dance and music of many cultures with contemporary and street dance styles by making new work and creating a new and exciting fusion. 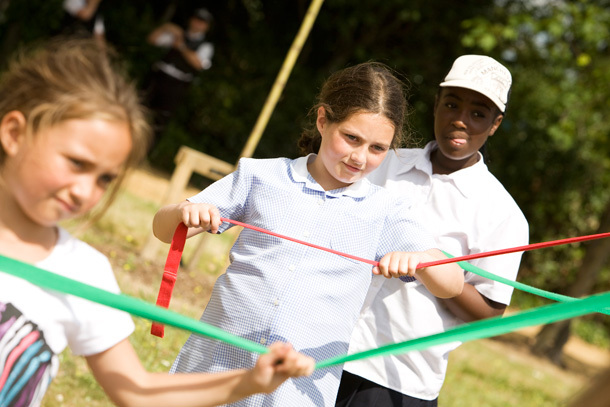 The initial idea of Street Dance the Maypole was launched by East London Dance at Big Dance in 2010 where Natasha and Kerry worked with several schools and arts festivals, including the Barbican, to create upbeat performance pieces and participatory workshops for all ages to join in. 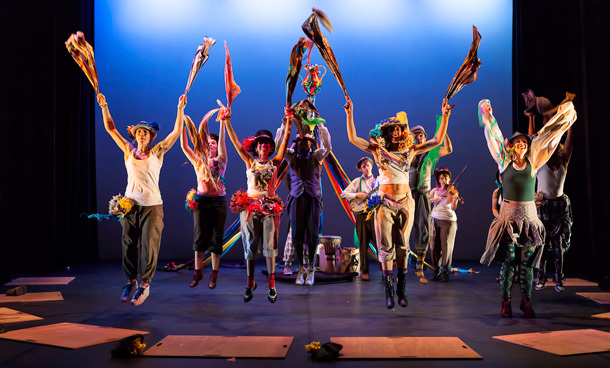 In 2011/12 they continued to build and develop the workshop programme, at events such as the Queen’s Diamond Jubilee at Battersea Park, and began to develop their new company, Folk Dance Remixed, and devise the show, Step Hop House. Alongside the show they created the Ceilidh Jam social dance and pop-up performances and workshops. 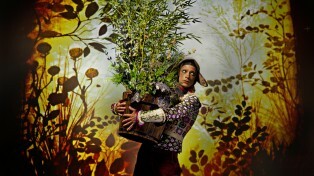 In 2013 they received their first Grants for the Arts award from Arts Council England. Following a tremendously successful tour over the summer of 2013, including appearances at Sidmouth Folk Week and Stratford Rising Festival, they are excited by the high demand for their work and look forward to more remixes in the future! Currently Kerry and Natasha are working towards another funding bid to take the show, workshops and Ceilidh Jam on a national tour in 2015. 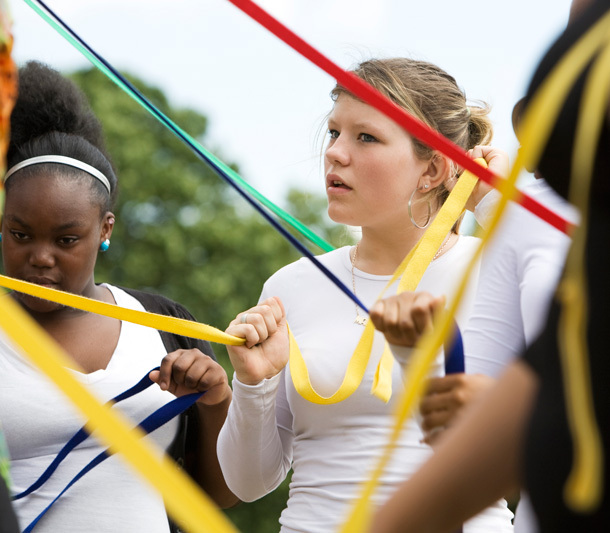 This will include the development of a youth dance company and a programme of holiday courses for young people. 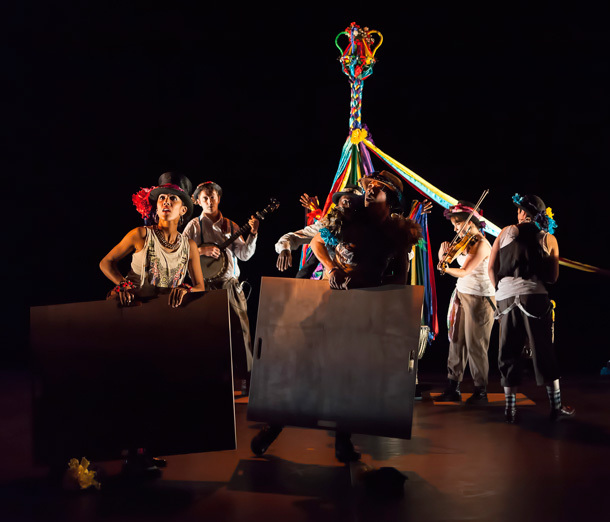 With a wealth of ideas for new work during the next few years, for example Remixed Rapper Sword Dancing and creating a full-length family show, they will be nurturing new partnerships to enable them to take their vision of magical, spectacular performances and participation forwards. A high-energy 30-minute professional performance offering a unique remix of maypole, clogging and ceilidh with street styles including house & breakdance & international folk styles including African & Bhangra…. All set to a live soundtrack with fiddle, banjo, percussion & beatboxing. 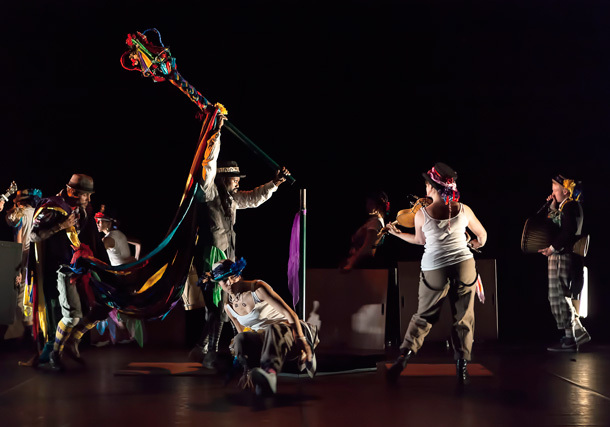 Performed by a cast of 9 diverse dancers with 4 musicians, this is folk dance like you’ve never seen it before! Jess Johnson, Head of Dance, Jo Richardson School, Dagenham. "Folk Dance Remixed is a company that truly fuses old with new, making obvious the links between different traditions of dance. Seeing their show at Cecil Sharp House the audience was a great mix of young funky urban Londoners with older, traditional folk dance fans. The ceilidh brought everyone together as if they always knew they been dancing to the same beat! A proper fusion!" Lina Johansson, Joint Artistic Director, Mimbre. Varmints tells the poignant story of a woodland creature's struggle to preserve a world in danger of being lost to the ever expanding city.